We have plenty of opportunities to learn about gardening in our climate and environment. Though we're in a semi-arid region, through strategic planning, we've created patches to take advantage of the moisture we have throughout the year. Check out our resources below to learn more. Learn more about the garden design. Full list of plants and trees in the park. Our park was designed with specific areas in mind, based on topography, natural moisture and sun/shade patterns, as well as soil composition and expected community use. Each patch is listed below, with descriptions of the plants and activities planned for that patch. The Orchard is home to over 10 varieties of fruit trees. Apples, plums, pears, and cherries! Unlike traditional orchards, nature does not plant a single species in a given area. The Orchard patch supports a variety of crops that offer harvests throughout the year. Cherries are ready to pick in July-late August. Apples, Pears, and Plumbs ripen in late August-September. Chives are a perennial member of the onion family that can be harvested multiple times throughout the year! The chives in this picture are flowering in June. The flowers are edible too! Wax Currants are native to Montana. The red berry is ready to harvest in late July-September. Haskaps, also known as honeyberries, are cold hardy berries that fruit in late June-July. This plant is new to Montana and is well suited for cold winters. Gooseberry stems are covered in thorns so you should wear gloves when harvesting. The berries should be picked for jelly in early July - August when the fruit is slightly immature. Jostaberries are a thornless cross of gooseberries and black currants. This sweet purple berry is ready for picking from early-mid summer. The park features two bioswales. These low lying landscape features are designed to collect rainwater and runoff from paved surfaces. Unlike city stormwater management which diverts rain and melted snow to a limited number of holding ponds, bioswales function like a living drain. Water collects in the vegetated swale. Leaves, stems, and roots slow the flow of water so the soil can absorb it. Pollutants can then be decomposed, broken down by bacteria, or absorbed by certain plants. The Lilac Hedge is one of the oldest plants in the garden park. Before the garden was planted, the hedge was the most popular feature among humans and animals. The lilacs added color to the park when the transplants were establishing themselves and maturing, and the beautiful flowers continue to blossom every summer. In 2018, under the direction of local artist, Jennifer Thompson, Bryant Elementary School students built a human-sized nest from twigs and branches. This ephemeral art project is tucked away in the hedge so you’ll have to search a bit to find it. Volunteers maintaining the Medicinal Meadow. Plants make hundreds of chemical compounds many of which function to protect them against disease and predation. When certain plants are consumed or applied topically, the active compounds in these defense chemicals produce desirable effects. While many isolated plant compounds have been scientifically studied, the effects of using a whole plant as medicine can be difficult to assess because of the mosaic of chemicals that plants create. Never consume any plant unless you are 100% sure you know what you are eating. Different parts of plants in this patch have been used as folk medicine; however, there is a general lack of clinical research on the effects and safety. Blue Giant Hyssop is an exceptionally hardy member of the mint family. Native Americans used the plant to treat coughs, fever, wounds, and diarrhea. The plant’s nectar-rich flowers attract a variety of pollinators, and the fragrant leaves can be used in teas and salads. Lavender, known for its fragrance and color, also has a history of medicinal use that dates back to ancient Egypt where it was used in the mummification process. In modern times, lavender oil is used for skin health, beauty, and relaxation. Sea Buckthorn produces a berry surrounded in legend. In Greece, the fruit was known as a full body healer and is said to have given Pegasus the power to fly. Genghis Khan’s success is attributed in part to feeding his army this “life oil”. Legends and health benefits aside, sea buckthorn produces colorful berry clusters that stay vibrant through winter. Our berm is more than just a pile of dirt; it’s a hugelkultur! Simply put a hugelkultur is buried wood. Starting with logs, branches, and twigs; volunteers buried this future compost to create a natural raised garden bed. As the logs first begin to rot, they retain water and make it accessible to plants. Over time, the core of the hugelkultur continues to decompose creating a nutrient rich soil. 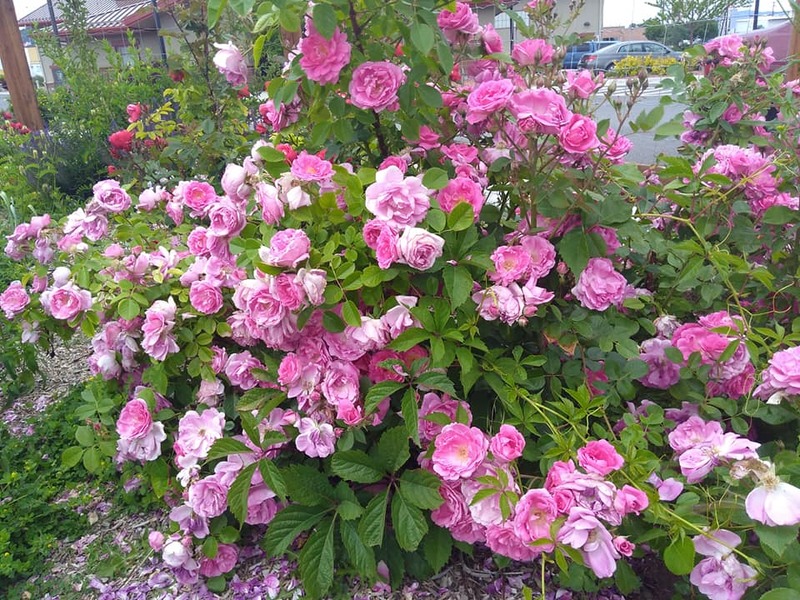 In addition to these benefits, the berm adds texture to the landscape and blocks westerly winds, effectively creating a favorable micro-climate for plants and animals. Check out the photo gallery to see some progress picks of the park’s berm. The Kid’s Patch design focuses on providing young gardeners with a place to learn, explore, and eat - a pickable playground! The species selected for this patch offer foragers of all ages berries to eat, herbs to taste, and flowers to play in. 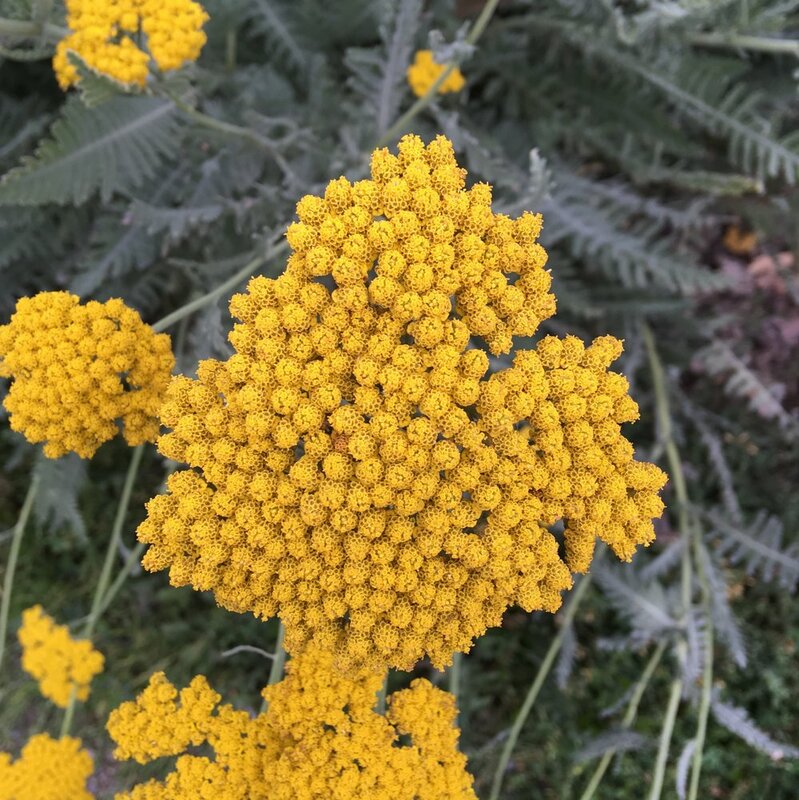 In addition to traditional garden harvests, we’ve planted a tapestry of textures ranging from fuzzy lamb’s ear to fleshy hens and chicks, and if you use your nose you’ll find a set of scents to experience too. The Native Plant patch features plants that occur naturally in Montana without human introduction or cultivation. These plants have a symbiotic relationship with the wildlife of the state that evolved over thousands of years. The plants in this patch create sustainable habitats that thrive in the region’s semi-arid climate. Long, cold winters and hot, dry summers with short springs and autumns create conditions that are optimal for the plants found in this patch. Kinnikinnick is a small woody groundcover with evergreen leaves and red berries. Sometimes referred to as bearberry, the Blackfeet Nation used the plant as food, and it was also commonly used as the main component in traditional North American Native smoking blends. Sweetgrass is an aromatic herb that is sacred to many Native American tribes. The photo above is from a sweetgrass braiding workshop led by the Helena Indian Alliance. Evening Primrose, featured in the photo below, have yellow flowers that open in a matter of minutes every evening before falling off the following day. This process repeats for the duration of the plants blooming, late spring-late summer. Jerusalem Artichoke, despite the name, is a sunflower species cultivated for its tuber which is eaten as a root vegetable. The water-wise patch is based on the xeriscaping principles of reducing the need for irrigation. Originally developed for drought-afflicted areas, xeriscaping is ideal for dry climates and places without reliable access to fresh water. The Pollinator Patch will be planted in 2019 and will be maintained by Helena Community Gardens. The wildflowers in this patch attract bees, butterflies, and other animals to pollinate flowers as well as the plants gardeners grow in their raised garden bed plots. Since pollinators are essential to maintaining a healthy ecosystem, flowers in this patch bloom throughout the growing season to attract beneficial insects and animals from early spring through late fall. Native species were selected because local pollinators are best adapted to the native plants that they evolved alongside of. The Living Fence is also being planted in 2019 to create an edible barrier between the public permaculture park and the rented community garden plots. We are also taking advantage of the existing lilac hedge which bisects the Park and also functions as a living fence. The grape arbor looks bare in early spring, but by late summer it overflows with grapes. Most grape cultivars are not hardy enough to survive Montana’s winters, and the short summers do not provide a long enough season for the grapes to fully sweeten. The Grape Arbor features four varieties of grapes that were selected because they ripen early and can withstand cold weather. The grapes are ready to harvest in late summer. The best way to tell if they are ripe is by testing a few. Just remember that unlike grapes from the grocery store, these ones have seeds in them. This is a living document. Tree and plant listings are updated on a semi-regular basis. The inventory is arranged by Patch and sorted By Common Name. This list can be particularly helpful to foragers interested in what edible plants and medicinal plants are found in the Garden Park. Explore the resources below to learn more about sustainable agriculture practices, edible forest gardens, and so much more! 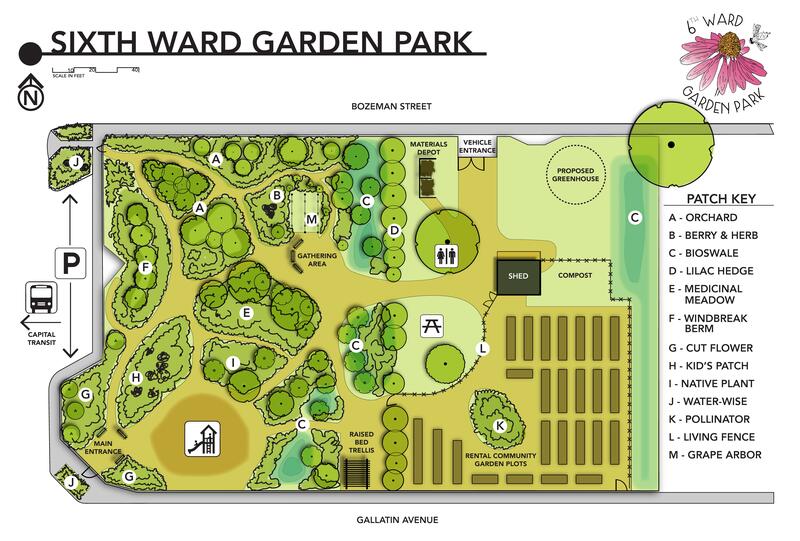 The 6th Ward Garden Park was designed with the help of Dave Jacke, an expert on edible forest gardening. This type of garden is designed to mimic woodland or forest ecosystems, but instead of using native forest species, we have used primarily edible and perennial trees, shrubs, and herbaceous plants. Montana State University Extension is an excellent resource for learning about sustainable gardening practices that are suitable for the unique climate in Montana. Helena Community Gardens is a non-profit organization committed to making gardening space available to all Helena residents. Visit their site to learn more, or to find and rent a community garden plot near you.